Think hard now. Can you remember your first virtual meeting? For many of you, it was in the latter decades of the 20th century, and you likely called it a "teleconference." If so, chances are you can recall how simple — but expensive — the technology used to be. Well, virtual meetings aren't expensive anymore. In fact, getting up and running with Web conferencing software today is so easy that virtually anyone with a PC and an Internet connection can do it. If it's that easy, how hard can holding a Web conference be? Careful. That's not as easy (as getting high-quality Web conferencing software). You can make mistakes. 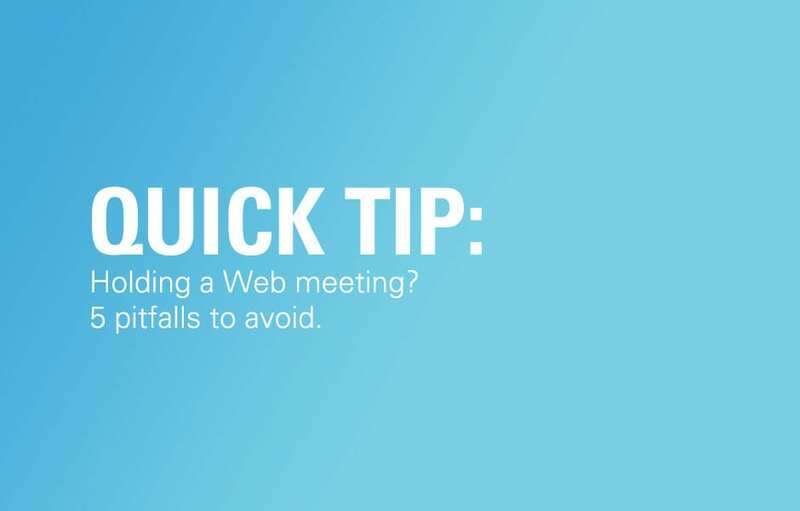 And blowing a Web meeting can cost your business money — either in lost sales (if it's a sales presentation) or in lost productivity (if it's a staff meeting). There are plenty of surveys today on how a Web meeting can boost your bottom line, but few, if any, that address what happens when those Web meetings bomb. And that's no surprise, because no one likes to talk about their slip-ups, virtual or otherwise. So, before you jump into a Web conference, let's review some of the most common Web conferencing errors, and discuss what can be done to prevent them. 1. You're having a Web meeting —but you probably should have had a face-to-face meeting. A Web meeting isn't a substitute for every kind of meeting. The No. 1 mistake small businesses often make is thinking that this newly affordable technology will actually eliminate their travel budget. "It's a good way to maintain a relationship," says Addison Schonland, Chief Executive of Innovation Analysis Group in La Jolla, Calif., and an experienced Web conferencing user. "It's not a good way to start a relationship. You can't read the expression on the participants' faces; you can't see their body language." But even if you're certain that a Web meeting is appropriate, Schonland advises caution. Solicit questions from the audience. Pay attention to the little things, like the breathing on the other end. "You may have blown the sale without even knowing it," he warns. Live Meeting participants can indicate their "state of mind" (for instance "I need help" or "I have a question") by using buttons in the application to change their "seat colors." That allows participants to give feedback without disrupting everyone. Pay attention to little things like that when you're the moderator. 2. You don't have an effective presenter or facilitator. "Delivery of the meeting is an area in which small businesses still lack experience, good reference models and tools that facilitate the effective management of a live online meeting," says online meeting expert Robin Good, publisher of MasterNewMedia.org. "The ability to provide appropriate visuals, supporting information, clear objectives and interaction with other participants are of the essence in making such meetings successful." In fact, many Web meeting experts say that, frequently, the weakest link in a Web meeting is a poorly trained or unprepared facilitator. Live Meeting offers a series of free resources for presenters that can make your Web meeting more effective. 3. You're using the wrong technology. It goes beyond the right software and hardware, according to Web meeting experts. And not to downplay the importance of those, because having the right equipment makes a big difference. But often it can come down to something as simple as bandwidth. "Make sure that meeting participants have appropriate connectivity," advises Richard Nicholas, chief executive of E Solutions Corp., a Tampa, Fla., datacenter and application development firm. "Dial-up connections generally do not work very well." Although most Web meeting software, including Microsoft Office Live Meeting, can run on a connection as slow as 56 kilobits per second (Kbps), it goes without saying that a faster connection is more desirable. Make sure your participants are appropriately connected. 4. You're not using the technology effectively. OK, so there are things you can't do during a Web meeting — such as look out into the audience to see if anyone is snoozing. But there are other things you can and should do. "Use polls, ask questions, engage the audience through the interactive features available to you," advises Mark Organ, chief executive and co-founder of Eloqua, a Toronto provider of marketing effectiveness solutions. "Your meeting participant will appreciate the attention and you'll be able to gauge effectiveness and share results in real time." Live Meeting offers features such as interactive polling, application and desktop sharing, a Q&A feature, and white board slides. If you use the Microsoft Office System, you'll find them easy to use, and the latest version of Live Meeting offers even tighter integration with other Office applications — so it's that much easier to learn. 5. You fail to follow up. After every virtual pow-wow the facilitator should do his or her due diligence. That's particularly important for sales meetings, when prospective customers may have additional questions about your product or service. Don't leave them in the dark after the session ends. Offering attendees a meeting summary of the slide deck or files used during the presentation, indexed recordings, and chat logs are all value-added resources for follow up. Some web meeting tools allow you to conduct evaluations, quizzes, send thank-you notes, and solicit opinions about future event recommendations by way of follow-up. Your next meeting can be a success as long as it's carefully planned, takes advantage of your technology, but also appreciates the limits of the Internet. Stay in contact with your participants even after your session has ended, and your Web meeting will have proven to be a success.